This beverage is another one from my recent Pre-Prohibition birthday party. Don’t be fooled by it’s cherry-pop color; the Irish Rose is a manly dose of whiskey perfectly co-mingled with a swig of grenadine. 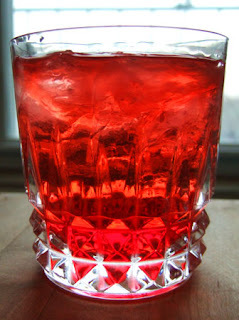 We really don’t drink enough grenadine these days. This has become my favorite beverage for my four-o’clock Judge Judy cocktail break. I think it will become yours, too. From The Ideal Bartender by Tom Bullock, 1917. Fill a glass with ice; a rocks glass or a tumbler will do. Add grenadine and whiskey. Fill glass with seltzer. Stir until condensation appears on the outside of the glass and the contents are thoroughly mixed. Serve and enjoy.